Black Women's Agenda President Gwainevere Catchings Hess, Gena King, and Simone Askew at the awards luncheon. Eugena “Gena” King began her classes as a first-year student at Gustavus Adolphus College on Tuesday, September 4. Less than two weeks later she was in Washington, D.C., mingling with the likes of Congressman John Lewis, Tina Knowles-Lawson, and the Rev. Al Sharpton. 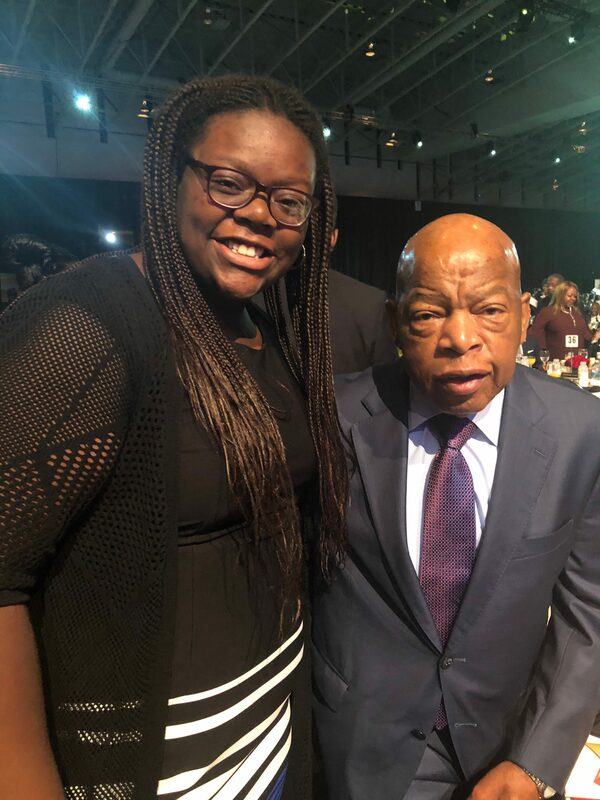 Gena King with U.S. Representative John Lewis. 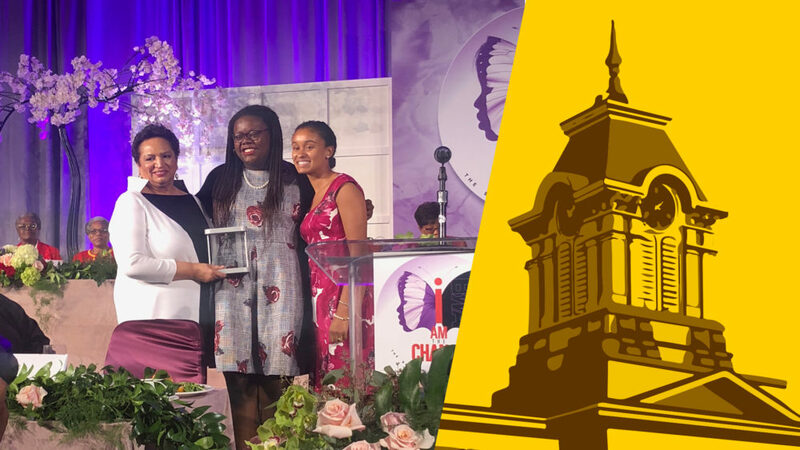 Hailing from Indianapolis, Ind., the new Gustie was in the nation’s capital to be recognized as the winner of the Black Women’s Agenda’s Bright Futures Award and scholarship. 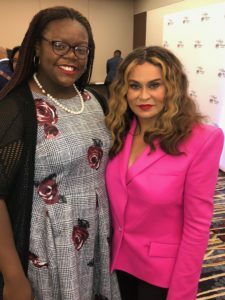 During the event, King was announced along with seven other winners of BWA awards including Knowles-Lawson; Georgia gubernatorial candidate Stacey Abrams; Karen W. Weaver, the mayor of Flint, Mich.; and Dr. Helene D. Gayle, president and CEO of The Chicago Community Trust. King, who plans to study political science, theatre, and classics at Gustavus, was nominated for the scholarship last year and pursued it at the urging of her grandmother and aunt. Her resume includes active participation in the African Methodist Episcopal Church, where she served as a youth president for her congregation and delegate for her district. She was also the senior class president at Herron High School, a public charter school focusing on classical liberal arts education. The scholarship award process included a series of interviews. King’s advocacy for issues facing the nation’s youth – including vocal leadership on gun violence and orchestrating walkouts in solidarity with students from Florida’s Stoneman Douglas High School – stood out. “It’s important for young people to get out there and let our voices be heard,” she said. Gena King with Tina Knowles-Lawson, entrepreneur, fashion designer, philanthropist, and mother of musicians Beyoncé and Solange. The idea of advocacy, speaking up, and taking action was reinforced at the BWA awards luncheon. Originally, Gustavus wasn’t on King’s radar; she applied on a whim while completing the Common Application. But then she received her admission letter, followed by an invite to fly to Minnesota to attend the College’s Building Bridges Conference and Diversity Achievement Summit. After visiting campus, her plans quickly changed. Now, less than a month into her time as a Gustie and with BWA’s Bright Futures Award propelling her ahead, King is setting her sights on what’s next. She wants to be a political Foreign Service officer for the United States Department of State. To build toward her dream, she’s taking Russian language classes to supplement the four years of Latin she studied in high school. King is also a member of the Gustavus Three Crowns Curriculum, a unique liberal arts program that focuses on connections between disciplines, between ideas and values, between past and present, and between learning and life. “It’s nice to be in a place where people have diverse opinions from different backgrounds and talk about why they think things, not just what they think,” King said. And during the rest of her time at Gustavus? The plan is simple, the Bright Futures award winner said. Founded in 1977 in Washington, D.C., The Black Women’s Agenda, Inc. is a nonprofit organization that generates awareness and support for issues that secure, protect and advance the rights of Black women and their families. BWA is comprised of 22 collaborating organizations — sororities, civic, service and faith-based — representing millions of women worldwide. Eyes have not seen and ears have not heard what God has planned for you. Blossom and continue to grow. Congratulations and Blessings to you!! !